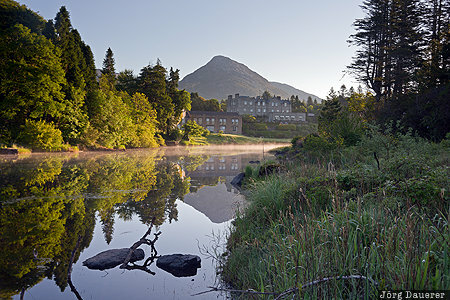 Ballynahinch Castle in front of Ben Lettery and its reflexions in the calm water of the Owenmore River illuminated by warm morning light. Ballynahinch Castle is in Connemara, County Galway in the west of the Republic of Ireland. This photo was taken in the morning of a sunny day in May of 2016. This photo was taken with a digital camera.